Some problems you run into with your car are small problems. Cracked radiator hoses, blown fuses, or worn brakes are all problems that can leave you stranded but in the end are simple fixes that can get you back on the road quickly and easily. On the other hand, some problems can make you start to wonder if it’s time to get a new car or at least a new motor for your old car. 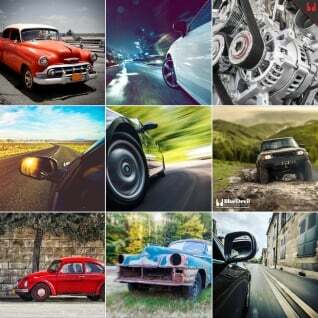 These can include blown head gaskets, worn piston rings or a cracked engine block. These types of problems usually require major overhauls, lots of labor costs and sometimes weeks of downtime for your car. Today we’re going to talk about a cracked engine block, how it happens and what your options are. A cracked engine block is such a big deal because of what your engine block is made out of. Most of the time when metal breaks, the answer is simple: weld it back together! In the case of your engine block, this, unfortunately, isn’t possible. Cast Iron has different properties than most carbon steels that make it impossible to weld. The extreme heat that it takes to weld most metals is enough to cause problems with cast iron and cause the surrounding area to be surprisingly brittle and weak after the weld. You can get a crack in your engine block a few different ways. First, engine blocks can crack from excessive heat. Too much heat will cause enough expansion and contraction on mating surfaces and bolted joints to cause the faces to start cracking. In just the opposite scenario, very cold weather can cause your engine block to crack as well. Whether it is from the wrong mix of antifreeze and water, or you simply live in a very cold area, extremely low temperatures in the winter can cause the coolant in your engine to begin to freeze. Since water expands when it freezes it can push the walls of your engine block out enough to cause them to crack. You may find out that your engine block is crack a few different ways. First you may notice coolant leaking externally. If you find drips of coolant with no leaking gaskets, seals or hoses, you may have a cracked engine block. In this case, make sure it isn’t simply a leaking freeze plug that is causing your leak! In some cases, you may also have a cracked engine block that is leaking internally. In this case, you will find coolant in your engine oil which will turn your oil milky white or light brown. This can be catastrophic for your engine as watery oil is a very bad lubricant and can start to rust and pit vital bearing surfaces in your engine very quickly. 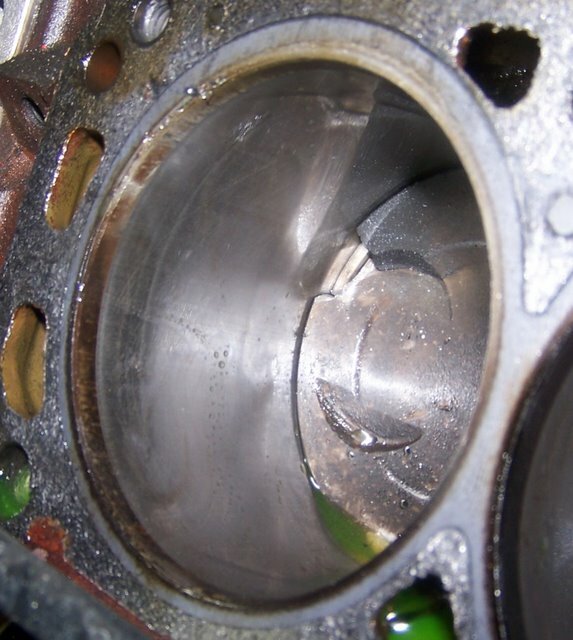 Lastly, it is possible to have a cracked engine block inside your cylinder. This type of cracked engine block will give the same symptoms of a blown head gasket and can be very difficult to diagnose. If you have a vehicle with a cracked engine block it can be tempting to simply junk the car or replace the entire engine. This can be a very expensive process or leave you with a vehicle. Rather than costly repairs, use BlueDevil Radiator and Block Sealer to seal the crack in your block and keep your car on the road. Unlike many leak sealers, BlueDevil Radiator and Block Sealer does not contain any fibers or particulates that simply clog the leak. BlueDevil Radiator and Block Sealer will actually bond to the cast iron block of your vehicle permanently sealing the crack in your block and keeping you on the road. We’re so confident BlueDevil Radiator and Block Sealer will stop your leak it is backed by our leak seal guarantee! When you’re ready to seal your cracked engine block, stop by any of our partnering local auto parts stores today! My ddaughter’s suv is leaving alot of smoke from exhaust however She’s not over heating and her oil is Black. ….is that enough info or do you need more? Based on your description, we would recommend using the BlueDevil Head Gasket Sealer. Not knowing specifically where the leak is coming from, the Head Gasket Sealer would treat a wider range of components ie. leaking heater core, leaking freeze plugs, warped/cracked heads, leaking radiator etc. and the BlueDevil Radiator and Block Sealer is specifically formulated for the radiator and the block. Thank you for you interest in the BlueDevil Radiator & Block Sealer. You can order the product directly on our website, http://store.gobdp.com/radiator-block-sealer-00205/. Simply add the item to your cart, enter your billing and shipping information, and complete the order checkout. i have a cracked aluminum engine block in my 2013 honda accord,its mixing oil n water in d radiator as well as the engine oil sump. Had the top gasket changed but the problem still persisted. How do i fix this problem? I’m in Nigeria. How do i get this product if it works on aluminum blocks. Thank you for asking about your Honda Accord. The BlueDevil Head Gasket Sealer is only intended for water/coolant leaks. It would stop the loss of water into the oil, unfortunately, it would not stop oil from getting into the radiator. Unfortunately, we do not manufacture a product intended to stop oil from getting into the radiator. A hard part repair may be your best option. Thank you for asking about your Honda Luxline. Is the vehicle losing water/coolant? Please contact our technical support line at 888-863-0426 so that we can get a little better understanding of the vehicle’s condition and be able to make any appropriate recommendations. What/How are the steps to get the warranty? Please contact our technical support line at 888-863-0426 so that we can assist you in obtaining the warranty on the product. My car’s coolant box got empty within 300 kms or less still after 3 times head gasket repair.They dismantle the engine each time open it and replacing head gasket but still suffers coolant loss.Owner of hyundai verna fluidic 1.6 ltr diesel engine.can u please suggest what is the main issue in head or engine block? Thank you for asking about your Hyundai Verna. Is the shop performing the work sending the heads out to a machine shop to be surfaced? It is very strange that you have had the head gaskets replaced multiple times and are still experiencing a coolant leak. The work the shop did should be under warranty, however, so you may want to bring the vehicle back for a proper diagnosis. I have a cracked cylinder wall on a 4 cylinder engine would that do anything for it? We recommend using BlueDevil Radiator & Block Sealer. As long as the leak isn’t too severe you should have no problem sealing it with the BlueDevil. Hi….The mechanic check my Explorer and said it had a cracked block instead of seals. Would this help me? If so, please give me the exact name so I can purchase the correct item. Thank you for asking about your Ford Explorer. Please contact our technical support line at 888-863-0426 so that we can get a better understanding of the vehicle’s condition and be able to make any appropriate recommendations. I noticed that my oil was very milky so I changed it and it looked good for a few days and now it’s milky and watery again . Any suggestions ? From the sounds of it, you are experiencing the symptoms of a blown head gasket. We recommend using the BlueDevil Head Gasket Sealer (http://store.gobdp.com/head-gasket-sealer-38386/) to help seal your leak. You will want to change your oil before and after the BlueDevil process. Feel free to contact our technical support line at 888-863-0426 with any other questions. My diesel has about a 7 inch crack along the side of the block. It leaks about a gallon every 40 miles or so. Can you help me or am I screwed? Due to the size of the crack BlueDevil would be lost to quickly for it to have a chance at sealing the leak. Unfortunately, you may need to have the hard part repair. I have a 4 inch hair line crack at lower engine block that leaks/drips oil slowly. Can it be sealed? If so how do I apply product?Have 1999 Cadillac Eldora Northstar Engine. Unfortunately, we do not make any products that are designed to stop oil loss coming from the block. BlueDevil Radiator & Block Sealer is specifically made to stop coolant loss. It sounds like the vehicle is getting combustion/exhaust gases blowing into the cooling system and creating pressure. In this case we recommend applying BlueDevil Head Gasket Sealer (http://store.gobdp.com/head-gasket-sealer-38386/). To give yourself the best overall chance of BlueDevil working successfully, in addition to the directions, you should remove the spark plug from the cylinder with the leak; this will be the spark plug from the cylinder getting the misfire reading. Leave that plug out for the 50 minute idle in order to relieve the pressure from building up and thus allowing the product to seal properly. My Isuzu 250D is also leaking oil through a hair line crack on the exterior of the block…. Thank you for asking about your Izuzu 250D. Unfortunately, we do not manufacture a product intended to stop oil leaks from the Block. A hard part repair may be your best option. Do you happen to know where the leak is coming from? Please contact our technical support line at 888-863-0426 so that we can get a better understanding of the vehicle’s condition and be able to make any appropriate recommendations. It sounds like the vehicle is getting combustion/exhaust gases blowing into the cooling system and creating pressure. In this case we recommend applying BlueDevil Head Gasket Sealer (http://store.gobdp.com/head-gasket-sealer-38386/). To give yourself the best overall chance of BlueDevil working successfully, in addition to the directions, you should remove the spark plug from the cylinder with the leak; this will be the spark plug from the cylinder with the lowest compression reading. If you are not sure which one that is, you may pull all of the spark plugs and will notice one will have a white-crystal-like substance on it and/or may look dirty; this is the plug you should pull. Leave that plug out for the 50 minute idle in order to relieve the pressure from building up and thus allowing the product to seal properly. Be sure to follow the guidelines for the proper amount of BlueDevil to apply based on your cooling capacity. Dripping antifreeze, 2003 GMC Safari, hubby thought it was water pump, went to change it and antifreeze still is pouring out. it was low on antifreeze a few weeks ago when it was -4 and hubby is wondering if maybe the block cracked because of it. Any advice? Hate to get a new vehicle. Thank you for asking about your GMC Safari. Based on your description, we would recommend using the BlueDevil Head Gasket Sealer (32 oz yellow label), found here: http://store.gobdp.com/head-gasket-sealer-38386/ . As long as the vehicle can maintain idle for 50 minutes, and you are not losing more than about a quart of water/coolant during that 50 minutes, you would be a good candidate for the product. my toyota mr2 3sgte is getting water bubbles in coolant while idling. we replaced the head gasket but that didnt fix problem. probably a crack in head or block. would this product help? how do i use it? It sounds like the vehicle may be getting combustion/exhaust gases blowing into the cooling system and creating pressure. To give yourself the best overall chance of BlueDevil working successfully, in addition to the directions, you should remove the spark plug from the cylinder with the leak; this will be the spark plug from the cylinder with the low compression reading. If you are not sure which one that is, you may pull all of the spark plugs and will notice one will have a white-crystal-like substance on it and/or may look dirty; this is the plug you should pull. Leave that plug out for the 50 minute idle in order to relieve the pressure from building up and thus allowing the product to seal properly. Be sure to follow the guidelines for the proper amount to use based on the size of your cooling system. Thank you for asking about your Ford Explorer. The BlueDevil Radiator and Block Sealer is only intended for water/coolant leaks. Unfortunately, BlueDevil does not manufacture a product for stopping oil leaks from the block. A hard part repair may be your best option. My boat block has a 2 inch block crack from a harsh winter in Colorado. Could I use this product to seal it from the outside of the block? Thank you for your interest in the product. Unfortunately, the BlueDevil Radiator & Block Sealer is not designed to seal leaks from outside of the block. The product works internally, is attracted to airflow and reacts with heat to form a chemical weld. A hard part repair may be your best option. The Farmall 400 blocks are common to cracks. Have a small horizontal crack just below where the dry sleeve sets in block and a also small vertical hair line crack at the bottom of the sleeve bore where it meets with the oil side of the block. These are dry sleeve engine. On another of these blocks I have there is a verticle crack that crosses from the cylinder bore to the valve lifter bore. will this product seal these. Thank you for asking about your Farmall 400. The BlueDevil Radiator and Block Sealer is intended for water/coolant leaks that are seeping or lightly dripping from the block or radiator. Feel free to contact our technical support line at 888-863-0426 with any other questions. Thank you for asking about your Jeep Wrangler. Based on your description, we recommend using the BlueDevil Head Gasket Sealer (https://store.gobdp.com/head-gasket-sealer-38386/). As long as you are not losing antifreeze too quickly, you would be a good candidate for the product. You would want to change the oil before and after the BlueDevil procedure. I took my 2009 Honda CR-V to 2 shops who said that I have a blown head gasket/cracked head. The engine does not turn over and start all the way. Thank you for asking about your Honda CR-V. Unfortunately, if the vehicle is unable to run/start, you would not be a good candidate for the product. The vehicle would need to be able to idle for a full 50 minutes without overheating or stalling out in order to achieve proper results. A hard part repair may be your best option. Hi – we have a 1966 Oldsmobile 98 Cotner Bevington-made hearse in extremely good condition. It has a 425 ci engine. Yesterday, while driving, the engine overheated and blew coolant out through the radiator cap – we think the old radiator cap actually split and that’s how it started. It completely drained the radiator. The radiator cap has a very strong smell, now. Also, now when the engine starts up, there is tons of whitish smoke coming from the exhaust pipe and some white smoke coming from under the hood. We have had, over the years, a slight engine oil drip (we have to keep the garage floor covered) but it has never accumulated to very much. Any hope for us with one of your products? We’ve got her in the auto shop now to see what has happened. I’m afraid it’s a cracked block. Thanks. Thank you for asking about your Oldsmobile. It sounds like the vehicle is getting combustion/exhaust gases blowing into the cooling system and creating pressure. We would recommend using the BlueDevil Head Gasket Sealer (32 oz. yellow label) found here: http://store.gobdp.com/head-gasket-sealer-38386/ . To give yourself the best overall chance of BlueDevil working successfully, in addition to the directions, you should remove the spark plug from the cylinder with the leak; this will be the spark plug from the cylinder with the low compression reading. Leave that plug out for the 50 minute idle in order to relieve the pressure from building up and thus allowing the product to seal properly. I have a 3 inch crack in cast iron block of my 1998 Durango causing coolant to drip (and occasionally stream) out underneath the vehicle. Is this crack too large for your product to work? Thank you for asking about your Dodge Durango. Based on your description, we recommend using the BlueDevil Radiator & Block Sealer, found here on our website: http://store.gobdp.com/radiator-block-sealer-00205/. The cooling system should be clean and free-flowing for best overall results. Feel free to contact our technical support line at 888-863-0426 with any other questions. Hi i have honda civic 2006. My car loose antifreeze continuously and my car mechanic says that there might be a crack in block. What should i do ???? Please contact our tech support team at 888-863-0426 so that we can get an idea of how quickly you are losing coolant. Depending on how large the leak is, we may have a product that we can recommend. We can be reached Monday – Friday, 8:00 AM – 5:00 PM EST. I have a 93 6.5 diesel.. there is a 4 inch hairline crack above my glow plugs on passanger side and 3 ” crack by my starter on driver side.. could the block sealant be a temperary fix untill insave up another 700 for another block? Thank you for your question. How quickly are you losing water/coolant? Is the vehicle overheating at all? Please contact our technical support line at 888-863-0426 so that we can get a better idea as to the extent of the leak and be able to make any appropriate recommendations. Thank you for asking about your Oldsmobile. As long as you are not losing water/coolant too quickly, you would be a great product for the BlueDevil Head Gasket Sealer. You may use either Head Gasket Sealer. The “Pour N Go” (16 oz./white label) is a less concentrated formula that does not require the removal of the thermostat or a flush of the cooling system prior to use. Whereas the “Mechanic Approved” (32 oz./yellow label) requires both the removal of thermostat and a flush before applying the product; the 32 ounce is the more concentrated formula. The product with the yellow label will give you best overall results as long as you can remove the thermostat and flush the system prior to use. With the use of either product, be sure to follow the guidelines for the proper amount to use. Thank you for asking about your Toyota Hiace. Based on your description, it sounds like the vehicle is getting combustion/exhaust gases blowing into the cooling system and creating pressure. This can be confirmed using a “block dye tester”. If the combustion/exhaust gases are present then we definitely recommend adding BlueDevil Head Gasket Sealer. To give yourself the best overall chance of BlueDevil working successfully, in addition to the directions, you should remove the spark plug from the cylinder with the leak; this will be the spark plug from the cylinder with the low compression reading. If you are not sure which one that is, you may pull all of the spark plugs and will notice one will have a white-crystal-like substance on it and/or may look dirty; this is the plug you should pull. Leave that plug out for the 50 minute idle in order to relieve the pressure from building up and thus allowing the product to seal properly. Be sure to follow the guidelines for the proper amount to use based on the size of your cooling system. I have a Volvo 2004 S60 that is losing coolant and try to fix what I could myself. But had to bring it to the shop & they told me that it probably has a cracked engine. My coolant is the blue coolant and I just wonder if your product will work for my car. Are there any videos on how the product works? Thank you for asking about your Volvo S60. As long as your vehicle can maintain idle for a full 45 minutes, and you are not losing more than about a quart of water/coolant during that 45 minutes, you would be a great candidate for the BlueDevil Radiator & Block Sealer. You can check out our YouTube for product spotlights and customer demonstrations. Yes, once you have completed the BlueDevil process, you may drain the system and add new antifreeze to the system. Feel free to contact our technical support line at 888-863-0426 with any other questions. Thank you for asking about your BMW 525tds. Based on your description, you would be a great candidate for the BlueDevil Radiator & Block Sealer http://store.gobdp.com/radiator-block-sealer-00205/. Feel free to contact our technical support line at 888-863-0426 with any other questions. I have a nissan 1 tonner bakkie, I took the crank shaft, and the engine block for reconditioning, when they come back as I fill in the water into the radiator, the water runs directly in to the oil sump before i even run the engine, can the blue devil product work? Thank you for asking about your Nissan 1 Tonner Bakkie. Based on your description, it seems you may be losing water a little too quickly for the product to be successful. It sounds like you would be losing the product just as quickly as you added it. Unfortunately, a hard part repair may be your best option. I have a renault kango and after having the cylinder head fixed and replaced it is still leaking oil into the water and I have a creamy brown oil mix in the water container. does this mean that i have a crack in the block or not. Thank you for asking about your Renault Kango. Based on your desciription, it sounds like you may have a head gasket leak or a cracked block. Unfortunately, BlueDevil does not manufacture a product intended to stop oil leaking into the water. A hard part repair may be your best option. Hi my Citroen dispatch is bellowing white smoke out,the diesel specialist says he thinks it’s a cracked head would your product work? As long as your vehicle can maintain idle for a full 50 minutes, and you are not losing more than about a quart of water/coolant during that 50 minutes, you would be a great candidate for the BlueDevil Head Gasket Sealer http://store.gobdp.com/head-gasket-sealer-38386/. Feel free to contact our technical support line at 888-863-0426 with any other questions. i have a 98 plymoth voyager 3.8 but i didnt have enough.antifreeze.in it and the motor has a crack inthe top of it and its getting tempature hot but the radiator water isnt getting hot nor is it blowing hot out the heater what should i do? Thank you for asking about your Plymouth Voyager. It sounds like you may not be getting the proper circulation in the cooling system. We recommend taking the vehicle to a certified ASE mechanic for a “block dye test” to check for possible combustion/exhaust gasses being in the cooling system. The reason for the direction of putting the heat on, blower to max, is to draw heat from the engine to keep it from overheating during the process. As long as the vehicle is not going to overheat, it would still be applicable to use the product. What if the vehicle overheat during the process due the heater not working? In order to get the benefit of using the product, the vehicle must be able to idle for a full 50 minutes. Otherwise, unfortunately, the vehicle would not be a good candidate for the product. Please contact our technical support line at 888-863-0426 so that we can assist you in obtaining the warranty on the product. Our nissan serena got overheat and heavy smoke come out at the front area of the car where engine is located. a hydrotest was done to check cylinder head and it has no problem. Now, mechanic is suggesting that a engine block crack maybe the reason for the water leak to oil. But it was not yet check if really the engine block has cracked. Will your product be applicable on this type of problem? if so,where we can buy ,we are from philippines? how much? Thank you for asking about your Nissan Serena. Based on your description, we recommend using the BlueDevil Head Gasket Sealer http://store.gobdp.com/head-gasket-sealer-38386/. The product is available on our website, and we do ship to the Philippines. Thank you for asking about your Mercedes C220. It is possible that you are getting combustion/exhaust gases pumping back into the cooling system. You can use a “Block Dye Tester” to confirm whether or not that is the case. If that is the case, we recommend using the BlueDevil Head Gasket Sealer (http://store.gobdp.com/head-gasket-sealer-38386/). I own a 90 Acura Integra, b18a1, 1.8l, 4 cylinder engine. Recently noticed an antifreeze leak and replaced the water pump. I added antifreeze to the radiator to see if there were any leaks after replacing the the tensioner pulley and timing belt. I noticed antifreeze leaking, but from a hairline fracture behind the tensioner pulley. Will the Blue Devil Radiator and Block Sealer fix this? Thank you for asking about your Acura Integara. The BlueDevil Radiator & Block Sealer is specifically formulated for leaks coming from the radiator and block. If the leak is coming from one of these areas, and you are not losing antifreeze too quickly (more than about a quart in a one hour run time), you would be a great candidate for the product. Have a 1964 Valiant with a cracked block near the water jackets. Welders tape has been previously applied and the vehicle does still run fine with some minor water leakage. Will your product work for this? Based on your description, we do recommend using the BlueDevil Radiator & Block Sealer for your Plymouth Valiant. As long as the vehicle will maintain idle for the full 45 minutes, and you are not losing more than about a quart of water/coolant during that 50 minutes, you would be a great candidate for the product. I have a Honda Civic 2006. I have an oil leak and my oil went to to my radiator. Would any of your products help me? Thank you for asking about your Honda Civic. Unfortunately, we do not manufacture a product intended to stop oil from getting into the radiator. A hard part repair may be your best option. The problem only appears when the engine is hot and radiator has pressure (7lb cap) then dries up when cold. How long should I allow the Blue Devil block and radiator sealer to do its work? Please contact us at 888-863-0426 so that we may discuss your vehicle and the best steps for getting BlueDevil to seal under your specific conditions. I have 2006 Honda civic. My mechanic said that coolant is leaking as there was engine block cracked. Do you think that your product can help my car? Honda offered 10 years extended warranty for this problem, but it’s expired now. Thank you for asking about your Honda Civic. Based on your description, we recommend using the BlueDevil Radiator & Block Sealer (http://store.gobdp.com/radiator-block-sealer-00205/). As long as you are not losing water/coolant too quickly, and the vehicle can maintain idle for a full 45 minutes without overheating, you would be a great candidate for the product. I have a 2007 Cadillac Escalade with oil in the coolant and I’m told this is due to a cracked engine block. I hadn’t noticed any engine problems prior to this news. Will your product seal the leak? Thank you for asking about your Cadillac Escalade. Unfortunately, we do not manufacture a product intended to stop oil from getting into the cooling system. A hard part repair may be your best option. Thank you for asking about your Chevy RV. Based on your description, we recommend using the BlueDevil Head Gasket Sealer (https://store.gobdp.com/head-gasket-sealer-38386/). You would want to change the oil before and after the BlueDevil process. Feel free to contact our technical support line at 888-863-0426 with any other questions. I have a 1955 Pontiac 287 that has a 3 inch crack under the intake manifold above cylinders 3 and 5. The crack runs horizontal between the lifter bores and the edge of the block. The engine is out of the car and apart but I’m reading many mixed reviews on stitching the wound or externally applied epoxy. I’m concerned about the head bolt bores as the crack would essentially run between where this blind end bottoms out. What would you recommend to repair the crack? Thank you for asking about your Pontiac 287. About how quickly are you losing water/coolant? Please contact our technical support line at 888-863-0426 so that we can get a better understanding of the vehicle’s condition and be able to make any appropriate recommendations. I have a small chip/crack just by the thermostat housing that is causing coolant to leak out. What do you recommend? How quickly are you losing coolant? Is the vehicle overheating at all? Please contact our technical support line at 888-863-0426 so that we can get a little better understanding of the vehicle’s condition and be able to make any appropriate recommendations. How quickly are you losing water/coolant? Is the vehicle overheating at all? Please contact our technical support line at 888-863-0426 so that we can get a little better understanding of the vehicle’s condition and be able to make any appropriate recommendations. My engine is knocking and there is and fast oil leak .. it was suggested there was a crack in the engine block ? What do I do ? Unfortunately, it sounds like you are losing oil a little to quickly for the BlueDevil Oil Stop Leak to be affective. A hard part repair may be your best option. We have a 99 Ford F-350 7.3 motor. We did have a small crack in the block but we used blue devil and it sealed it, at least I know it sealed it on the outside crack that we could see. Now here is the problem. We are still having issues with the truck over heating, It seems like it is building up pressure and then causing it to have so much pressure that it is pushing the water out the cap of the reservoir. We also just changed the clutch fan because we didn’t notice it turning on when the truck starts getting hot. It still doesn’t seem to be coming on with the new fan clutch. We are running out of ideas. Could there be another crack on the inside of the block? Thank you for asking about your Ford F-350. Are you still noticing a loss of water/coolant? 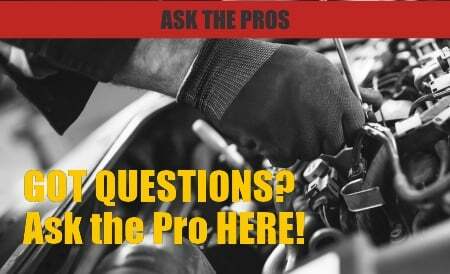 Did you use the Head Gasket Sealer or the Radiator & Block Sealer? Based on your description, it is possible that you are getting combustion/exhaust gases pumping back into the cooling system. You can use a “Block Dye Tester” to confirm whether or not that is the case. The BlueDevil Head Gasket Sealer (https://store.gobdp.com/head-gasket-sealer-38386/) would be able to seal leaks from warped/cracked heads. As long as you are not losing water/coolant too quickly, you would be a good candidate for the product. How to Fix an Oil Leak — Which Automatic Transmission Fluid Should I use?